Melbourne’s Gazi Restaurant is designed by architect Rodney Eggleston and graphic designer Anne-Laure Cavigneaux from March Studio. The first-time restaurant designers most pronounced feature is the sculpted ceiling space. Terracotta pots hang upside down from acoustic tiling creating an intimate dining atmosphere. Located in the iconic Herald and Weekly Times building, it features a minimalist wall finishing reveal ink stained industrial surfaces from the toner used in the space’s previous lifetime. Tasmanian oak booths designed by March Studio line the wall, softening the industrial finishes, and creating different seating experiences. Pendant lights drop out of the sea of pots constructing adding intimacy and another layer along the ceiling. Neon lights used at the entrance and bathrooms contrast with the warmth of the Terracotta pots but reflect the restaurants namesake for the Greek hub of Gay and Lesbian community. Techne Architects’ Prahran Hotel draws our attention back to the importance of the façade. The façade design utilised 17 oversized concrete pipes. Inside or out of the building the stacked pipes are a defining feature. 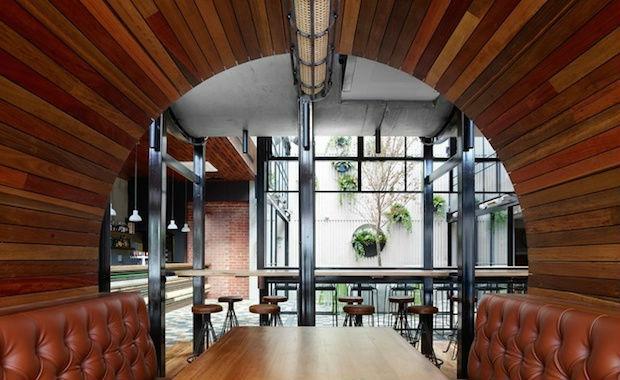 The staked pipes represent kegs, bottles or barrels, which is fitting for an Australian pub. Steel framed windows are incased in the barrels and provide port holes. The façade creates an attraction in its exterior environment. It contrasts with the traditional façade and modernises the public space. Patrons are able to physically interact with the façade as it serves a function purpose. Wood lined booths are encapsulated in each pipe, creating another dimensional experience. There are seating arrangements and spaces to engage with depending on groups, seasons or times of the day. The design was also inclusive of an airy courtyard. Kitchen by Mike is to strip down traditional restaurant dining to find something more honest with their mobile kitchen designed by Koskela. This innovative temporary design by Koskela draws its inspiration from the recent trend of pop up eateries. The design embodies and wheel barrow form, as mobility is the key theme. The kitchen incorporates a garden, water, heat and culinary tools. It can also be utilised as a dining table, kitchen bench or cooking-class counter. Serving as a highly functional design it still managed to have an aesthetically appeal. The use of raw materials such as wood and copper pipe reflects the honest cooking methods used by Kitchen by Mike. Understated finishes also assist the kitchen blending with the diverse environments it may find itself in due to its mobile nature. Carbon fibre aerospace wheels allow the kitchen to be easily moved. Located in Sydney, Farmhouse restaurant has a holistic approach and a shared aspiration to use recycled, salvaged and reclaimed material. Designed by Nicholas Gurney, it is inspired by rustic, 19th century European homes. Farmhouse is a 33 square metre, 20 seat communal dining restaurant constructed from salvaged and recycled material. An individual ethos was created around the notion of a Farmhouse; genuine, honest, simple, modest. A matte black facade is employed for the shop front and kitchen block to encapsulate the rustic farmhouse insertion and to boldly differentiate between old and new. The concept that is Farmhouse highlights the way an original and innovative concept can be integral to the success of a restaurant. Farmhouse is the direct outcome of design thinking and collaboration. Pony restaurant located in Sydney was designed by Matthew Darwon. It features a striking glass shopfront and an undulating timber ceiling. Timber is one of a number of elements used in Pony’s interior to create a subdued, rich aesthetic. It features a wall of stained glass panels creating a relationship between the restaurant interior and the street outside. The resulting wall is in panes of orange, red and clear glass, with some windows opening inwards to allow fresh air to circulate. The result is warm and eye-catching. The curved bar forms a second spine for dining, with in-built banquette seating on one side. Patrons sit at tables on a long bench, while towards the back a horizontal peephole allows you to see the chefs working in the kitchen. It also sinuous bar curves, with one end becoming seating for more dining tables. And at the front, there is a bar area for informal drinks and a rusted screen on the wall, which gives a raw edge. Illuminating the space is LED lighting hidden behind joinery and underneath the seating elements.